“The Shia Khan Empire in its conquest of Camarthen Prime began with little in the way of heavy armour and vehicles and instead focused it seems upon bringing through the Matter Gateway as many Legionaries as possible. As many troops as they could. This tactic made sense in the light that we thought the Belkan Depression without life and the threat gone due to the detonation of the fusion reactor in the midst of the labyrinth. While we were trying,in shock, to come to terms with the alien threat we assumed was now halted it was instead the case that under the ground the gateway continued to vomit forth more and more enemies so near to us yet unseen. When the Khanate broke through to the surface and brought the battle to us once more they had a great mass of infantry of their client races and a some fast vehicles for reconnaissance. Foremost among these were the Canthus bikes and the vicious Skrak Terror Birds. This large animal is a creature of bile and hate that seems to have a natural affinity with Maligs. Capable of running on its two legs at high speed it can cover a large area quickly and its long curved beak can easily snip the head from a knight in powered armour. We have no idea what the Goblins call these birds as the Skrak is our own name for them due to the distinctive and unpleasant noise they make. Capable of carrying a Goblin rider they have all been observed with Saurad riders as well. 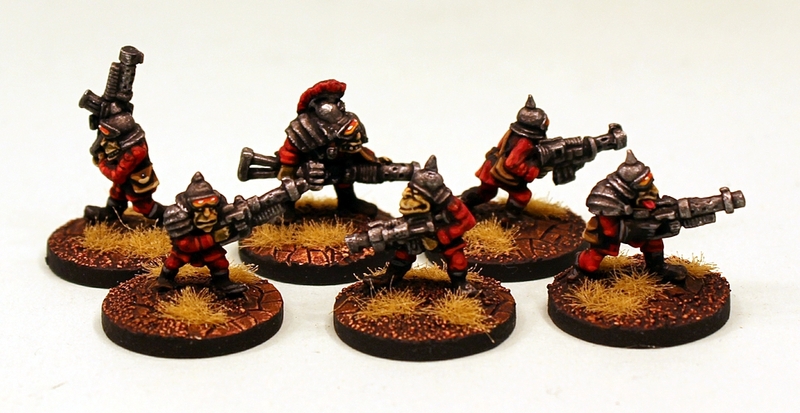 Tough and hard to put down the Skrak cavalry are a threat to Planetary Militia caught out in the open without support. Thus far no terror bird has been taken alive for study and observation has concluded for certain that the bird is not only cannibalistic but also eats its rider it given a chance. 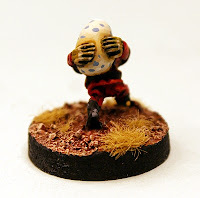 There are Maligs whose task it is to take the clutches of eggs laid by the Skraks from their nests to a separate hatchery for some 'training' upon hatching. This is a role which even the Goblins try to avoid..."
April is here and I pity the fool that thinks its not going to be a great month! We have new releases plus the Salute Season and a new monthly offer as well as the pre-orders on that book which you have all been hearing about too. It all starts here with the new monthly free miniature. 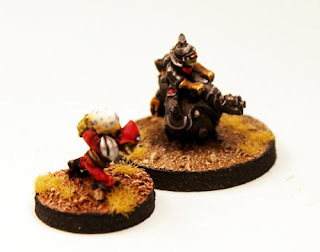 IonFans who have missed out on posts in March should check out the First Look at Pages and Offers on the coming Return of the Khanate book as well as the excellent Khanate Portable Weapons which came out last month plus the tale of Caracan the Strider too. We will have some vicious birds plus their handlers for you in April. All of this to come and we will feature it on the blog and across the sphere of the infoverse. Now onto the news for the start of the month. A new free monthly and an exotic one at that....it makes me eggstatic to present IMP44. The Ion Age is not only a Human place...it has aliens a plenty. This month that comes to the fore but not in the way you think with a humorous miniature that will not only look unique in your collection but be oddly useful with our new releases in April. 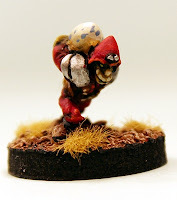 This month we present IMP44 Malig Egg Thief who will go right into your space goblin Ordos. 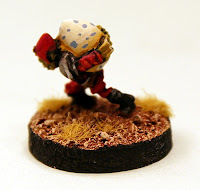 We welcome the 44th free monthly 15mm miniature and month of our little space opera setting. Free in every order every time all month before being retired. This miniature is automatically put into every order at the rate of one per order regardless of order value. It can also be bought in any amount on the monthly IMP page of the website for this month only too before being withdrawn on the first of next month. We are into Year Four now and if you missed it you can see the Year Three Collection on the website. Standing 12mm to the eye line the Malig Egg Thief labours under the weight of a Skrak Terror Bird egg that he has 'liberated' and is heading for any giant frying pan he can find (perhaps Senga can lend him one). Dressed in typical Malig fashion it is a unique 15mm miniature. There is a growing page on the Ion Age website where the current and all former IMP series free miniatures are shown so that you can see what came before. Enjoy looking at what came before. This miniature is worth 0.60GBP. 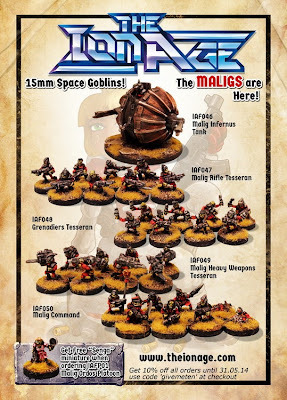 Lastly we have a new month long special offer...its a space goblin one with 25% off the original 15mm space goblins AIAF002 The Maligs. Providing a great core of infantry poses to your Khanate platoons of verminous Maligs this pack is excellent. The discount is online and all you need do is add to cart, reward points are as normal and can be used on this offer too. Offer ends 1st May. Click on the link to learn more. As always if you are reading this bulletin later in the month or further into the future please do have a look at our blog and use it as a time machine to read all the excellent content that is there going right back to our start. 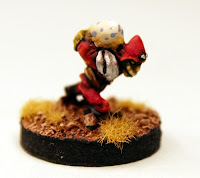 Try April 2014 for instance where you can find a the beginning of our expansion of the space goblins with the Malig Ordos platoon pack (33 different poses!) and the now firm favourite the mad cap Infernus Ball Tank. Here is our 2014 convention flyer showing them. Thanks for your support and for enjoying The Ion Age!